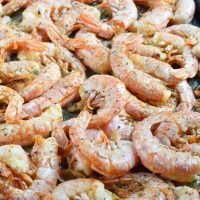 Oven Roasted Shrimp is quick, simple and delicious! This dinner or appetizer is swimming in butter, lemon and spices. Ready in 10 minutes! I received a variety of Pickapeppa products to facilitate this post. All opinions are 100% authentic. So I have a love affair with seafood, shrimp in particular. I have always loved shrimp, scallops, oysters, fish and crawdads. Pretty much anything that comes out of the sea is welcome on my plate. My mom and I used to go on yearly trips to New Orleans mostly because of all the fantastic food. This is where I also found Pickapeppa Sauce. It is practically on every table in New Orleans and goes with just about any meal. I’ve always been a fan of the original but after tasting the Pickapeppa Spicy Mango Sauce I am obsessed! 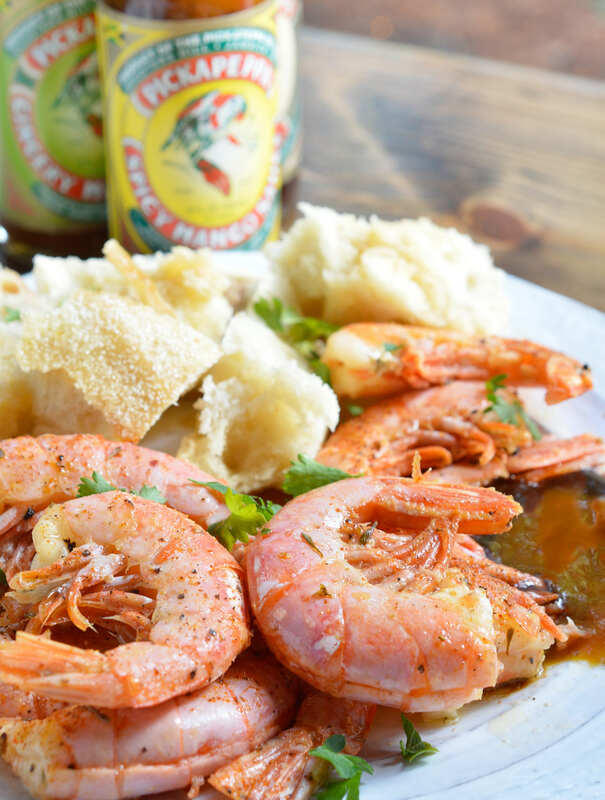 It is sweet and spicy and perfect for dipping these Oven Roasted Shrimp. 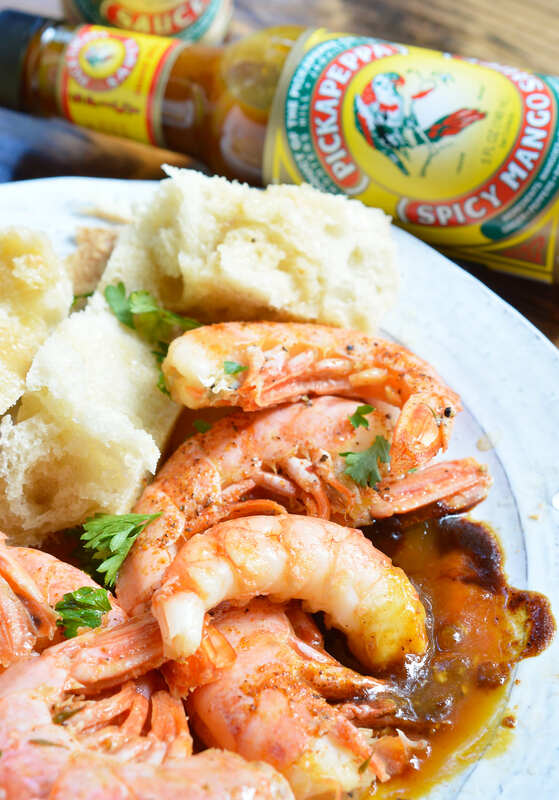 My all-time favorite recipe is New Orleans Style Barbecue Shrimp. It is to die for! 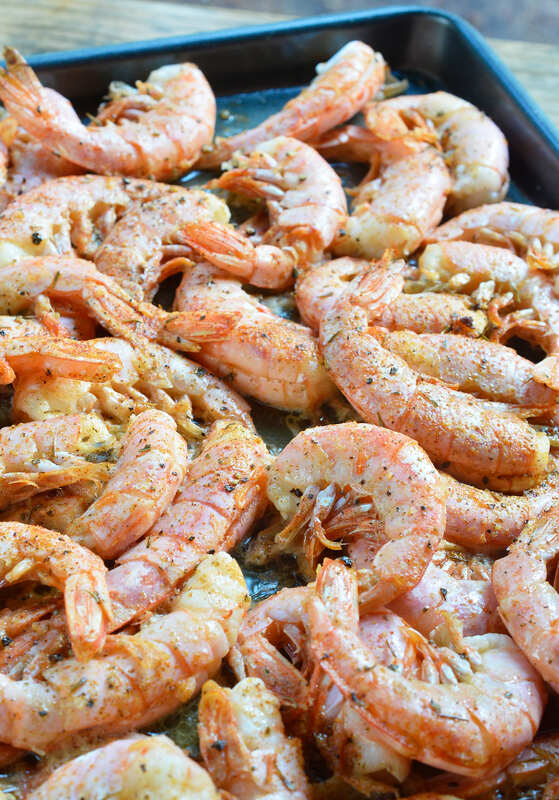 These Buttery Oven Roasted Shrimp are sort of a lazy version of my favorite. Or if you are craving pasta, try my Creamy Cajun Shrimp Pasta. This recipe is about as easy as it gets. 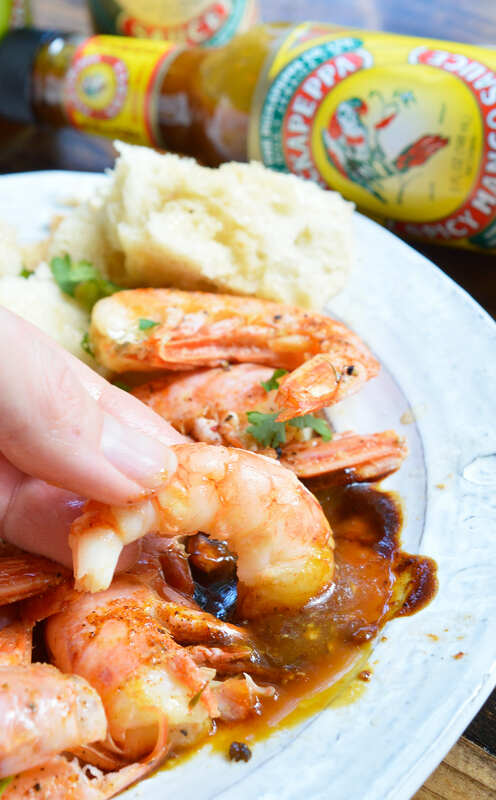 Just plop everything on a baking sheet and you have deliciously smothered shrimp in 10 minutes or less! I kept the flavors fairly simple with butter, lemon, Worcestershire sauce and cajun seasoning. Feel free to add your own flair. Garlic, peppers or seafood seasoning would be fantastic too. 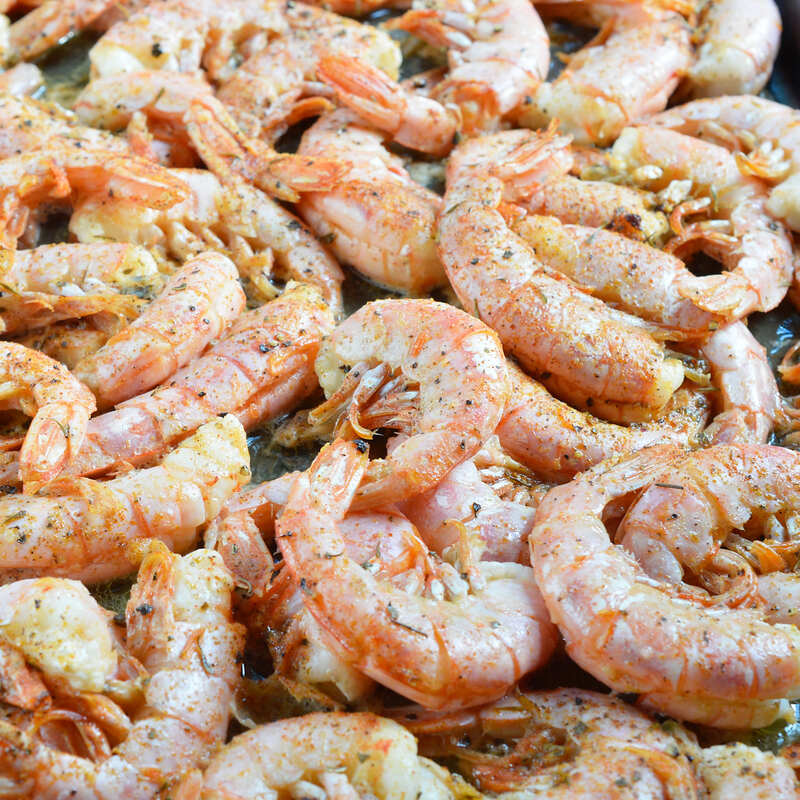 These shrimp make a great meal or appetizer, especially for holiday feasts. 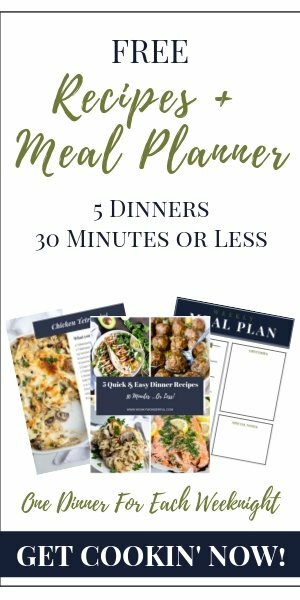 It is great for feeding a hungry crowd! Check out more shrimp recipes from around the web. . .
Rinse thawed shrimp in cold water and drain completely. In large bowl, toss shrimp with a generous drizzle of olive oil until evenly coated. Transfer shrimp to large rimmed baking sheet. Sprinkle with salt and pepper. Mix melted butter, lemon juice and Worcestershire sauce. Pour mixture over shrimp. Sprinkle with cajun seasoning. Bake for 6-8 minutes or until shrimp are pink and slightly curled. This recipe came out perfect!! So delicious!! Thanks so much :):) I’ve been wanting a damn good recipe for a very long time and these are wonderful! I am so excited about them .Can’t wait to make them again! Are these baked with the shell on as in picture or cooked peeled ?